Do you know of a young person between the ages of 10 – 12, who would like to become a veterinarian or veterinary nurse? Shoreline Animal Hospital is welcoming the next generation of animal enthusiasts on Saturday March 23 from 1:30 – 3:30 pm. Join us for an educational, interactive, hands on experience using stuffed animals and real cases. THE EXAM ROOM: How do you become a veterinarian or veterinary nurse? What jobs do a veterinarian and veterinary nurses do? How do you solve a problem when your patient can not talk? What role do animal shelters play in animal health? THE LABORATORY: Why does a veterinarian need the laboratory to help diagnose medical cases? Explore through the lens of a microscope. Help solve the case of why Sweetie is so thirsty. RADIOLOGY: Why does a veterinarian take an x-ray? Try on the protective aprons and learn how to position your patient. See if you can tell what is causing Rocky’s problem. Will Rocky need surgery? SURGERY: Why would a dog or cat need surgery? 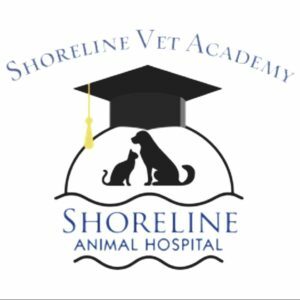 What different types of surgeries do we do at Shoreline Animal Hospital? What does a surgeon do before, during and after surgery? Learn about surgical instruments and monitoring equipment. Is there anything specific you need to share with us about your child? ** Our Hospital’s stuffed pets are volunteering for the learning stations. We will not have any live animals and the hospital will be closed for appointments.